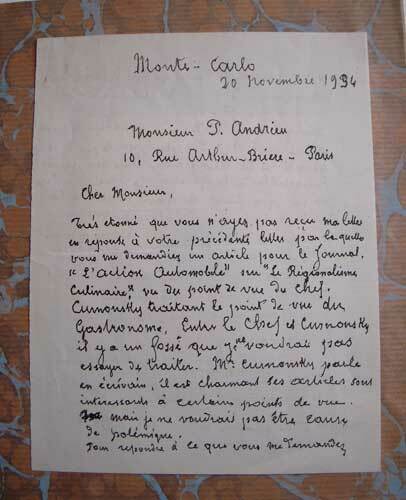 Addressed to Monsieur P(ierre) Andrieu, --- Paris. 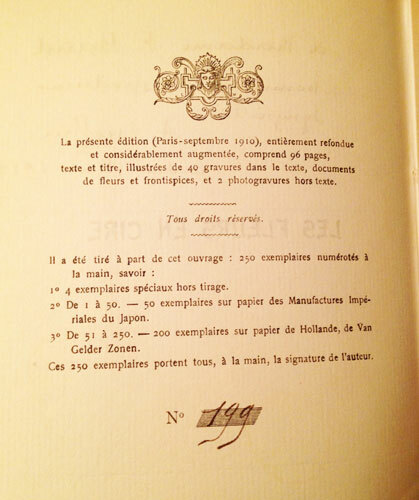 The two pages are covered in Escoffier's handwriting. There is also a one page English translation of the letter. A very clean item. Enclosed in a neat marbled cardboard folder. With a label on the front cover. The letter is from the library of Pierre Orsi, the famous Lyon restuaranteur. A rare item. 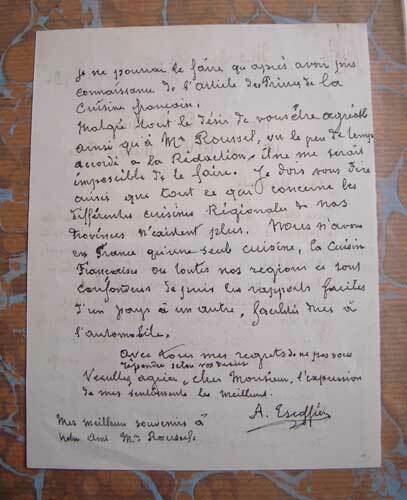 - The letter is written one year before Escoffier's death. He writes in a rather shaky hand -- [Dear Sir, I am very surprised that you did not receive my letter which was in answer to yours, whereby you were asking me to write an article for the newspaper "L'action automobile". This article should have been about regional cuisine as seen from the point of view of the chef - Curnonsky treats it from the point of view of the gastronome. Between the chef and Curnonsky there is a wide gap that I do not wish to bridge. Mr Curnonsky speaks as a writer, he is charming and his articles are interesting in places but I have no desire to be the cause of any arguments. To answer your question, I could only do it after reading the article "les princes de la cuisine francaise". Despite all my desire to be agreeable to you and Mr Roussel, it will be impossible for me to do it. I must also tell you that the different regional cuisines do not exist anymore. Ever since all the "regions" have been merged by the advance of the automobile which created easier access from one country to another, we have now in France only one cuisine and that is French Cuisine. -- With deepest regret for not acceding to your wishes, Yours sincerely, A. Escoffier. -- My best wishes to Mr Roussel.] Pierre Andrieu was an author of many articles and books in the domain of wine and gastronomy. He was also a collaborator of Curnonsky's. 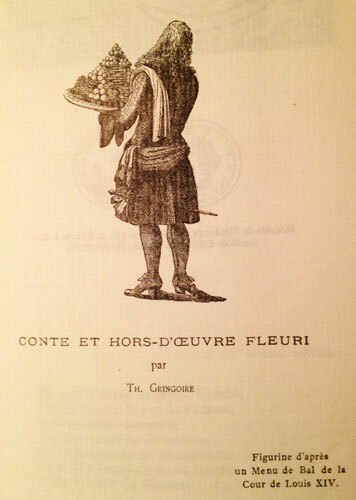 Together they published in 1935 a book about the restaurants of France, titled 'Les Fines Gueules de France'. This letter pertains to the research for that book. Maurice Edmond Sailland (October 12, 1872, Angers, France – July 22, 1956, Paris), better known by his pen-name Curnonsky and dubbed the Prince of Gastronomy, was the most celebrated writer on gastronomy in France in the 20th century. He wrote or ghost-wrote over 65 books and enormous numbers of newspaper columns. He is often considered the inventor of gastronomic motor-tourism as popularized by Michelin, though he himself could not drive. The contents of the letter display an ironic point of interest. Escoffier, one year before his death is offering a glimpse of the changes he is seeing to his beloved French cuisine. Having re-organised, during his life time, the French kitchen so fundamentally from that of the Bel-Epoque era he is still only really interested in viewing the changes from the chef's point of view. It is obvious that even at the grand old age of eighty eight, he is still active and well informed. 12mo. September 1910. 190x147mm. 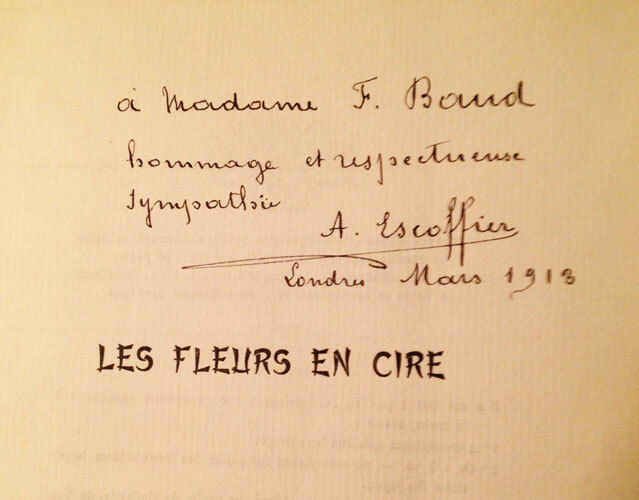 2feps Half-title with signed dedication in ink by Escoffier, -- "a Madame F, Band hommage et respectueuse sympathie A. Escoffier London Mars 1918". 1p explaining the limited editon, this copy 199 0f 200. 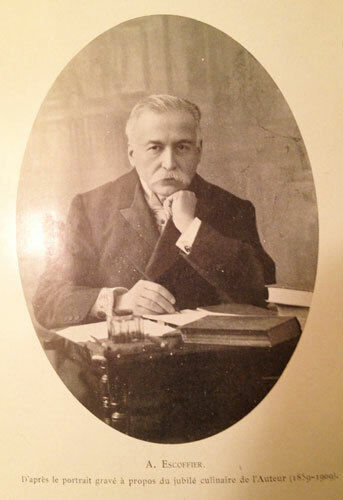 Frontispiece photogravure portrait of Escoffier with tissue guard. Title page. 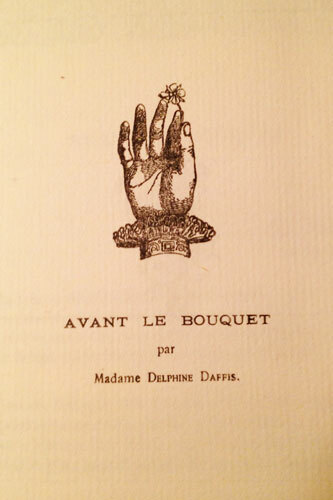 1p Dedication to Madame Daphine Daffis (Escoffier's wife, who also contributed to this book). (1)10-11 with in-text illustrations. 3p with illustrations. (1)16-23 Les Fleurs du Fabuliste. 1p with Illustration. (1)26-94. 1p Du Meme Auteur. 1p with Illustration. 1fep. A limited edition of 200 copies in cream coloured papier de Hollande, de Van Gelder Zonen. 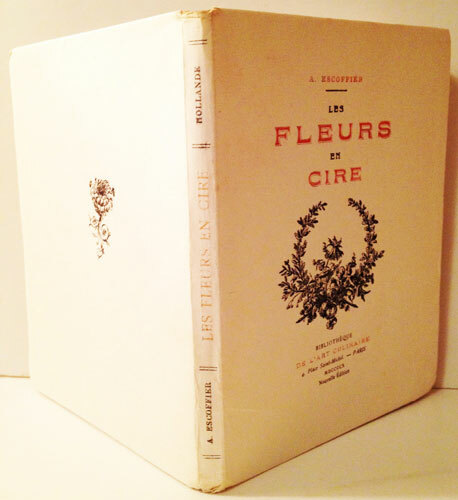 40 photo engraved illustrations in-text with halftone illustration titled "Fleurs de Magnolia en Cire". A very nice original untrimmed copy in excellent condition - as new. - This edition is a very special limited and augmented one of 250 copies; 50 published in paper des Manufactures Imperiales du Japan and 200 in papier du Hollande, de Van Gelder Zonen, all signed by Escoffier. Maggs p151, 1st of 1886. Vicaire, a 1st of 1886. Cagle has a ordinary text copy, a 4th of 1910. Bitting has a 1st of 1886 dedicated by Escoffier to his great friend Madame Sarah Bernhardt. 1.-- A Dinner Plan of Tables. Thursday. July 21st 1910. 2.-- Special Dinner Menu. Monday. September 16th. 1918. 1. -- This card is decorated by a double gilt border, front and back. On the front is an emblem of the American flag and the Union Jack. 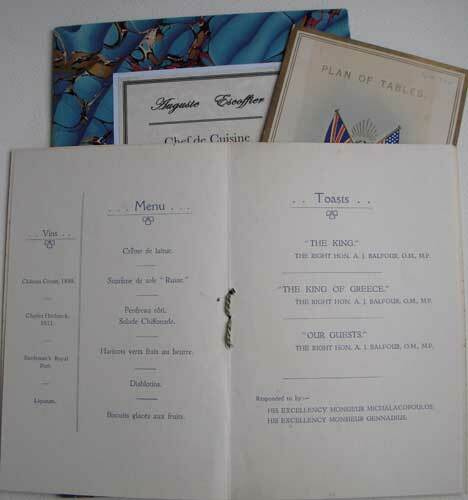 It is a four page ‘Plan of Tables’ for a Dinner in honour of General Stuart L. Wilson at the Carlton Hotel, Thursday, July 21st 1910. Seated at the ‘Red Table’ is Lieut. Sir Ernst H. Shackleton who was to set out 4 years later on ‘Endurance’ for his ill-fated attempt to reach Antarctica. It has taped marks on the back, indicating it has been sometime mounted in a book. 2. 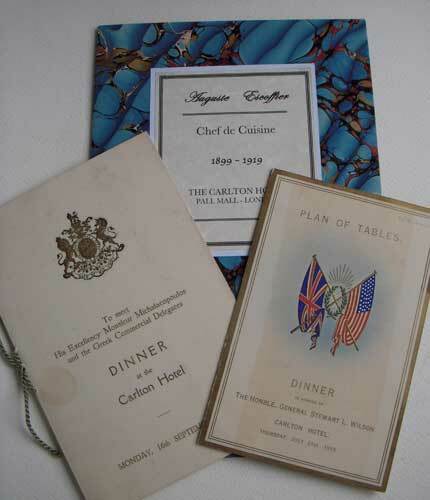 -- The menu is for a special Dinner at the Carlton Hotel on Monday 16th September 1918. Hosted by the Hon. A.J. Balfour MP for His Excellency Monsieur Michalacopoulos. The menu has an embossed gilt crest of the Royal Coat of Arms. Mons. Andre Michalacopoulos was the President for the Counsel of Ministers and Minister for Greek Affairs and A.J. Balfour was British Prime Minister from 1902 – 1905. It is a nice clean menu card with a 2 page insert tied by a ribbon. Both are housed in a nice cardboard, marbled folder with a label on the front cover. Rare Escoffier ephemera items. 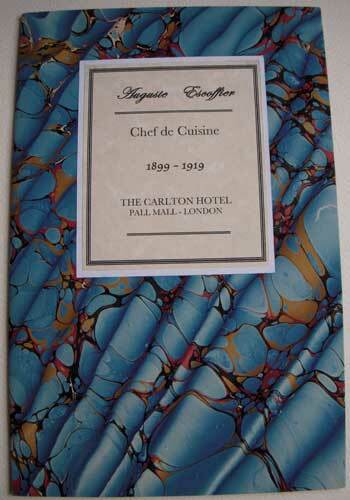 - Escoffier was Maitre Chef de Cuisine at the Carlton Hotel from 1899-1919. These two items are his, from the Carlton Hotel kitchen banqueting department. FIRST EDITION. 1934. Original D/W with small chips at the top and bottom of the spine and folds at cover edges. Otherwise very bright. Fresh green cloth boards and spine with yellow writing. Slightly rubbed on the edges. The front paste-down has a signed dedication by E.D. 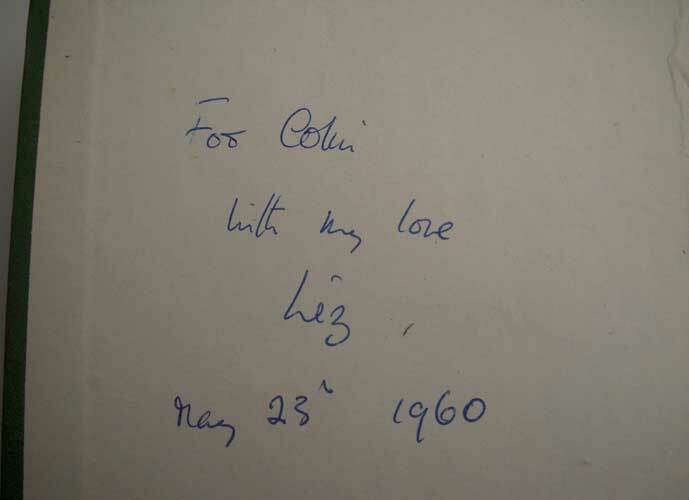 : "For Colin with my love Liz May 23rd 1960" 1fep. Half-title. 1pp Du meme Auteur. Title page. 5-8 Introduction. 9-673. 3pp Menus Types. 677-703 Table des Metieres. 1fep. Unusually bright copy as the paper is usually quite browned. 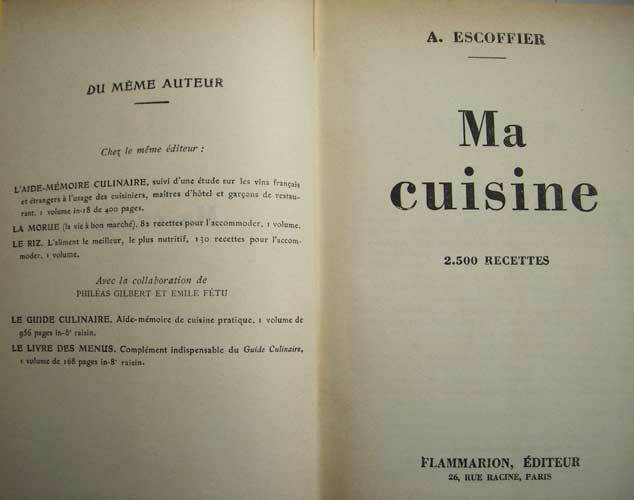 - First French editions of Ma Cusine are quite scarce, but this one is rare, coming from E.D's library and with her signature. A real collectors item. 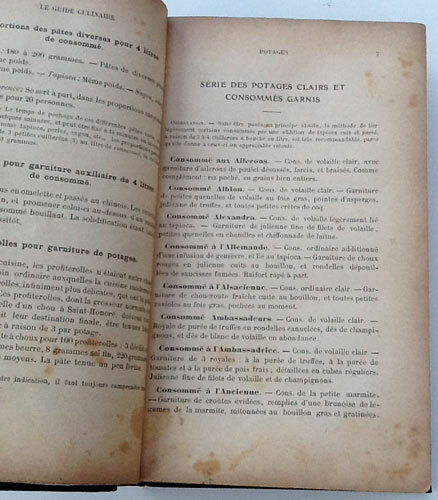 A. ESCOFFIER avec la collaboration de PHILEAS GILBERT et EMILE FETU LE LIVRE DES MENUS Compliment in indespensable du Guide culinaire Se trouve a Paris. Chez MM. DUPONT ET MALGAT 40, Rue Coquilliere, 40 Tous droits de traduction, de reproduction et d'adaptation reserves pour tous les pays. FIRST EDITION. 253x164mm. 1fep. Half-title. Title page. p.5-6. Avant-Propos. 7-164. [165-166] Folding chart titled - "Tableau de Service dans une Grande Cuisine" tipped in at the end. 1fep. Internally very clean but very lightly browned throughout as is normal with the paper used at that time. Rebound in a full red cloth hard cover. Back lettering stamped directly onto the spine. A very nice copy. 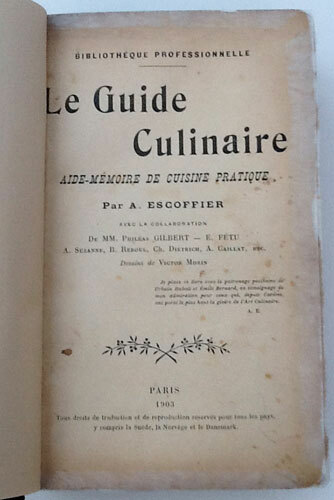 - The folding plate first appeared in 1903 in the first edition of Escoffier's major work "Le Guide Culinaire" This copy has a retailer's stamp on the half-title page by 'Maison Dupont et Malgat 40, Rue Coquilliere, 40. Paris. 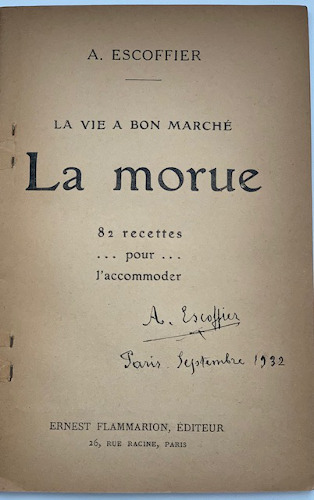 A. ESCOFFIER LA VIE A BON MARCHE La morue 82 recettes -- pour -- l'accommoder ERNEST FLAMMARION, EDITEUR 26, RUE RACINE, PARIS. 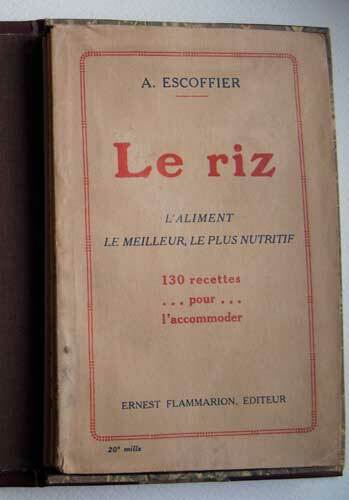 A. ESCOFFIER Le riz L'ALIMENT LE MEILLEUR, LE PLUS NUTRIF 130 recettes -- pour -- l'accommoder ERNEST FLAMMARION, EDITEUR 26, RUE RACINE, PARIS. BOOK 1. FIRST EDITION. 1929. In original Yellow cover with red writing. The front cover with the same exact text as the title page. 1 fep. Half-title. Title page. pp  V1-V11   10-67. p2. Advertisements. Wonderful clean condition. -- BOOK 2.FIRST EDITION. 1927. In original Yellow cover with red writing. The front cover with the same exact text as the title page. Half-title. Title page. 8-79. Covers and paper lightly browned throughout, but still a very nice copy in its original state. Both books housed in a clamshell box bound in half dark brown leather with marble boards. The spine with raised bands, gilt lines and gilt tooling. Also with a red and green label and gilt lettering. The interior laid with fawn felt. - Escoffier started cooking in his uncle's restaurant at the tender age of thirteen. He was born in the village of Villeneuve-Loubet, near Nice on the 28th October, 1846 and died at Monte Carlo on 12th February, 1935. He was a prolific writer publishing many Culinary gems over a long distinguished career as the most famous Chef in the world. La Riz and La Morue were among the last of his ten major works, which he published at the respective grand ages of 80 and 82. 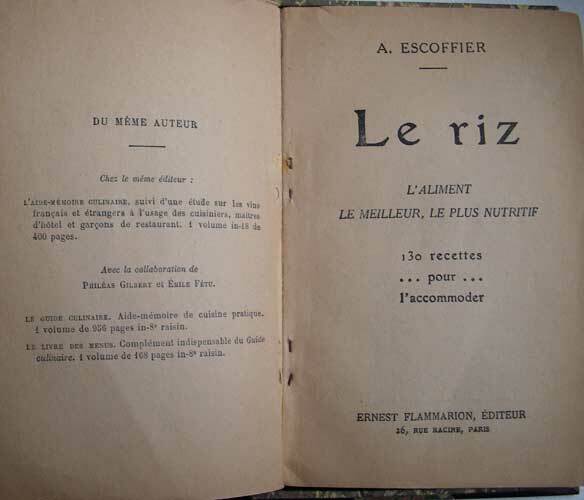 (While Le Riz is scarce, Le Morue is very rare) His last book 'Ma Cuisine' was published in 1934 at the age of 87 -- by any standard; a remarkable life. 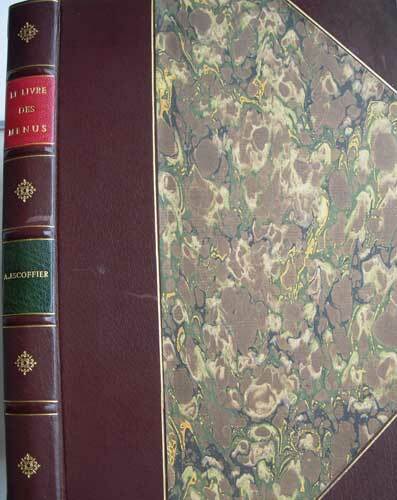 A beautiful leather bound box to house two fine original Escoffier books, especially the very rare 'La Morue'. 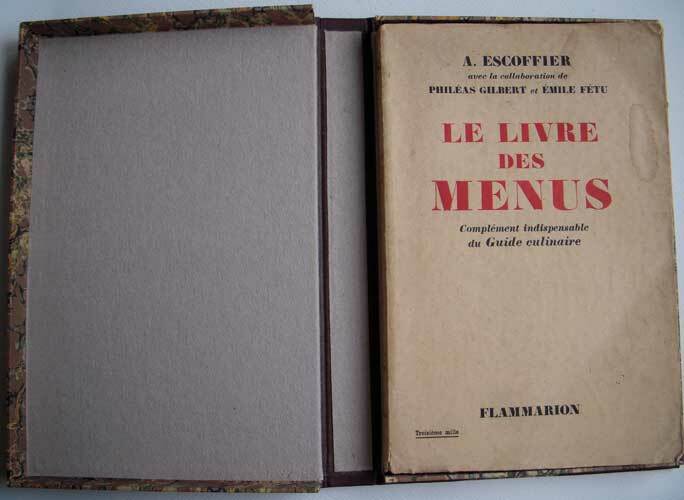 A. ESCOFFIER avec la collaboration de PHILEAS GILBERT et EMILE FETU LE LIVRE DES MENUS Compliment in indespensable du Guide culinaire FLAMMARION EDITEUR 26, rue Racine, Paris. FIRST EDITION. 1912. 253x164mm. 1fep. On verso – Du Meme Auteur Half-title. Title page. p.5-6. Avant-Propos dated Avril 1912,. 7-164. 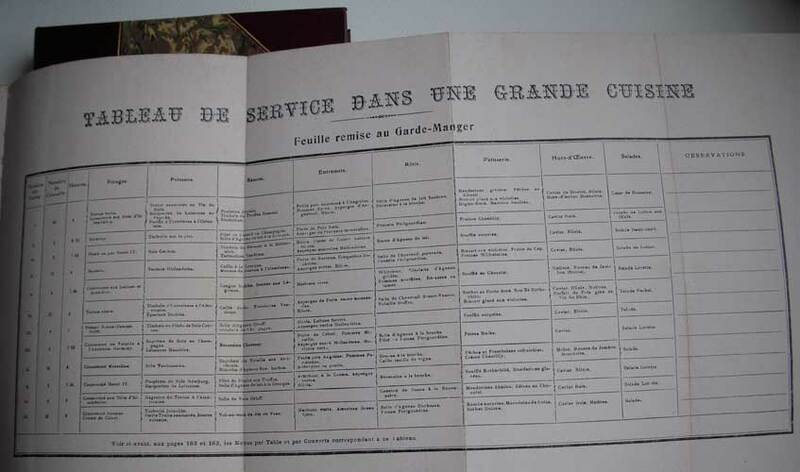 (165)  Folding chart titled - "Tableau de Service dans une Grande Cuisine". The covers are the original terra-cotta colour with red and black lettering. They are slightly browned, with the spine cracked but holding well. Internally, it’s very clean and bright. 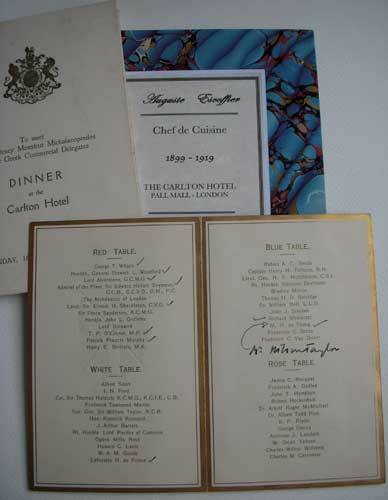 Also enclosed is a draft menu written by Escoffier at the Carlton Hotel, and dated by another hand in blue crayon - Mercredi 24-7-07 for Johnston Esq. 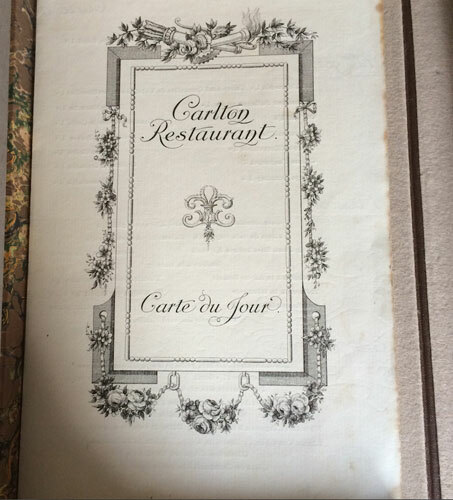 Also enclosed, one of Escoffier’s Carte du Jour printed menus from the Carlton Restaurant, the Carlton Hotel, Pall Mall, London, dated Dimanche, 21 Octobre 1906. In fine clean condition. All housed in a beautiful clamshell box bound in half dark brown leather with marble boards. The spine with raised bands, gilt lines and gilt tooling. Also with a red and green label and gilt lettering. The interior lined with fawn felt. 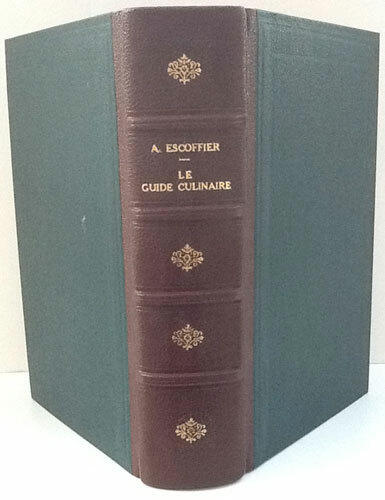 Wonderful rare Escoffier items in fine original condition. 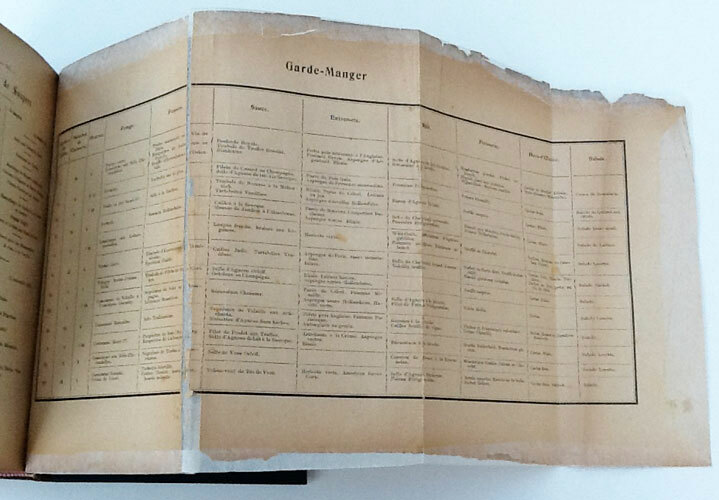 - The folding plate at the back of the book first appeared in 1903 in the first edition of Escoffier's major work "Le Guide Culinaire" The system laid out in the plate indicates the very precise way that Escoffier had re-organised the modern Kitchen from that of the Bel-Epoque era. It assigns the precise duties and dishes of each 'Partie' with the number of tables, couverts and times. 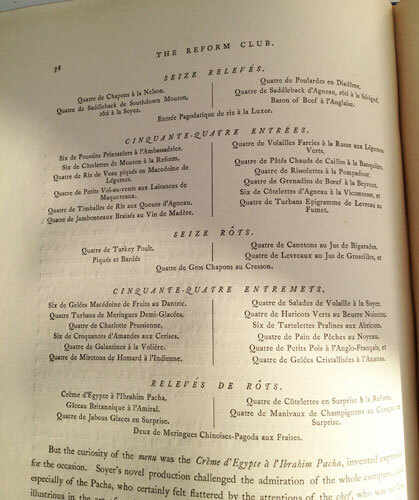 However this chart does not indicate that each individual dish eventually served to the guest would have been sourced from numerous Kitchen 'Parties' before being cooked by one Chef de Partie (either Chef Saucier, Poissonier, Entremetier etc) and assembled on a platter for the waiter to carry to the Dining Room. The one enclosed rare draft menu written by Escoffier is a clear example of how the process works. 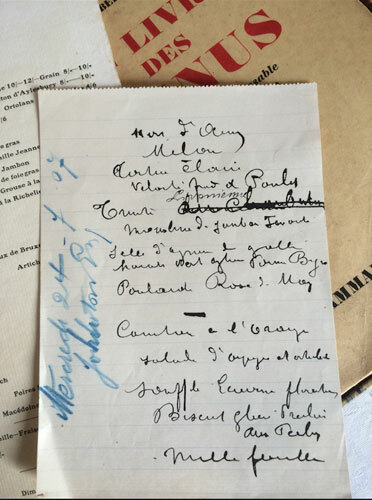 Escoffier writes the menu in his typically messy scrawl and it is then sent to a comptroller who writes on the menu, the date and the name of the recipient of the special Dinner. It’s then sent to be printed up on the formal designed menu cards to be placed before each guest at the Dinner. This special menu would also be written up in a more legible hand and posted on the kitchen banquet notice board one week before the dinner. As delineated in the folding plate, each menu is then broken down into the relevant kitchen department tasks, and each dish is then cooked and assembled for the whole dinner to served at the designated time. 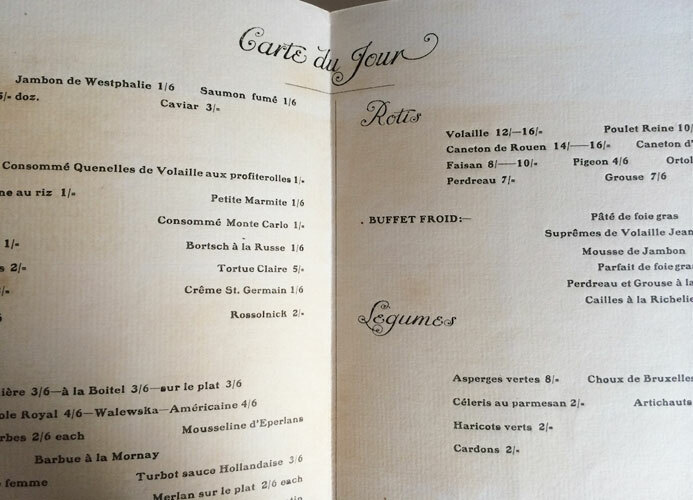 The Carte du Jour menu is also one of Escoffier’s daily menus. His tenure at the Carlton Hotel lasted from 1899 to 1919. 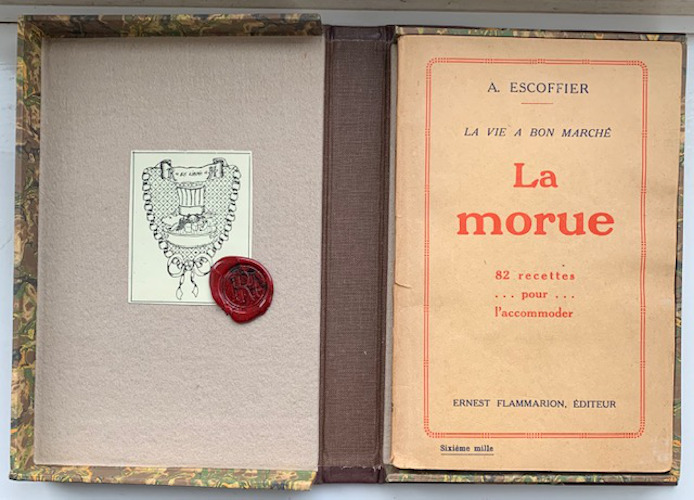 The book and the very rare items of Ephemera are a true and fantastic testament to Escoffier's far-reaching gastronomic influence within the highest reaches of English, European and American Society. 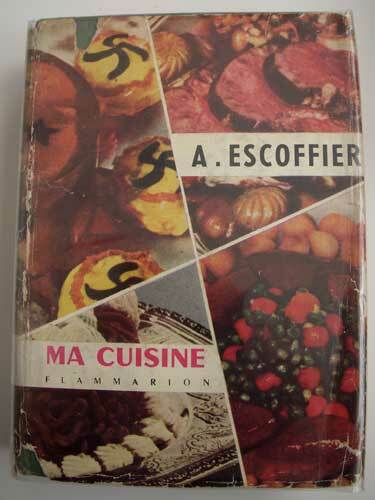 BIBLIOTHEQUE PROFESSIONNELLE Le Guide Culinaire AIDE-MEMOIRE DE CUISINE PRATIQUE Par A. ESCOFFIER AVEC LA COLLABOATION De MM. 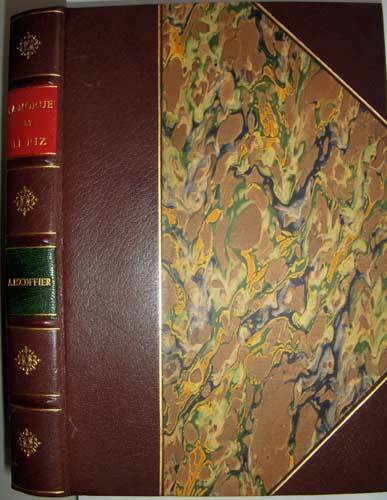 Phileas GILBERT - E. FETU A. Suzanne, B. Reboul, Ch, Dietrich, A. Caillat, ETC. Dessins de Victor Morin - Je place ce livre sous le ptronage psthume de Urbain Dubois et Emile Bernard, en teimoignage de mon admiration pour ceux qui, depuis Careme ont porte le plus haut la gloire de l'Art Culiniare. A.E. - (printers device of two olive branches) PARIS 1903 - Tous droits de traduction et de reproduction reserves pour tous les pays, y compris le Suede, la Norvege et le Danemark. FIRST EDITION. 224x145mm. Front paste-down and end-paper with marbled paper. 2feps. Missing the half title with with advertisements on verso . Title page. 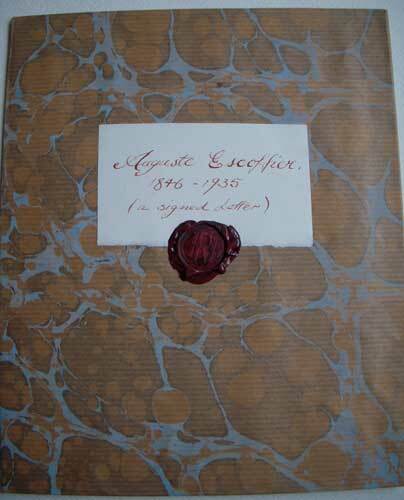 Escoffier's facsimile signature on the verso. (1)V1-V11 Avant Propos. Verso with Abbreviations. (1)X Remarques. 1p Advertisement. Verso with Tables de Chapitres. (1)2-766. 1p Methode de Repartition. 768-769 Menus. 1p plus 1 Folding plate showing service times and tasks. 771-786 Menus. (1)788-790 Table. (1)+p792 Errata. 4p Advertisements. 2feps. Back end-paper and paste-down with marbled paper. All paper age browned and slightly brittle which is typical of this and other books of this time, due to poor paper being used. First 4 pages and last page are are preserved and protected by clear tissue and the folding plate has been backed by clear tissue one of the folds separated but held by the tissue. The last 2pages are a little more darkened than the rest. New modern bottle green morocco boards and brown morocco spine with raised bands and tooled gilt devices and writing between the compartments. First editions are very scarce. - Escoffier's great classic. Incomparable in many ways, not least in the fact it laid out what is now the modern Kitchen brigade with its departments clearly delineated and all recipes recorded that are still widely used today as the basics in most big Kitchen brigades. A mark of its classic place in Gastronomic history is that the recipes are still the basis of most Culinary schools curriculum. The great man is being re-discovered in this day and age once again. A sign of his lasting impact and a true appreciation for the skills and basically true recipes he used and recorded, in a time when change has become almost the norm, and food fads abound. A DISCOURSE OF SALLETS. By J.E. S.R.S. Author of the Kalendarium. [A quotation in Greek from the Greek dramatist, Cratinus] 'It is in every man's power to season well' LONDON, Printed for B. Tooke at the Middle-Temple Gate in Fleetstreet, 1699. FIRST EDITION. 1fep. Title Page with double lined border. 20pp.Dedication. 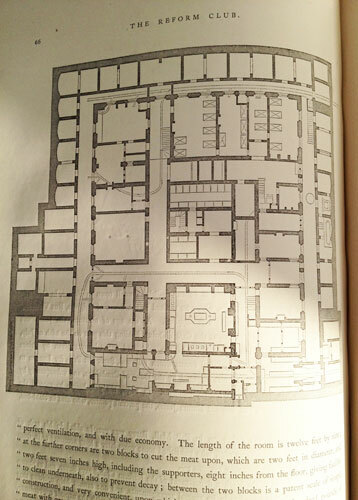 10pp.Preface 6pp.The Plan of a Royal Garden. 1-192. 2pp.Folding Table between 108-109. 35pp.Appendix. 13pp.Table. 1pp.Errata. 1fep. All pages uniformly browned. Title page and first page of the dedication backed with clear page tape without visual loss of text. Very nice early full mottled calf binding, raised bands with gilt lines, dark orange label with gilt lettering. With a nice aged patina. Very rare. 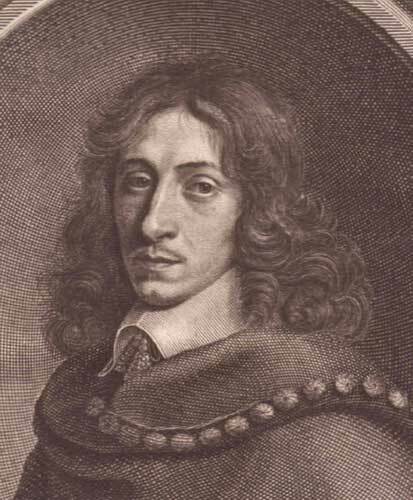 - John Evelyn (1620-1706) was a prolific writer and translator, touching on politics, manners, and religion as well as the more practical arts of architecture, painting and engraving, sculpture, numismatics, and perhaps what he is best known for (besides his diary) gardening and forestry. His most important original contributions are perhaps 'Sylva' which he composed at the behest of the Royal Society in 1664. 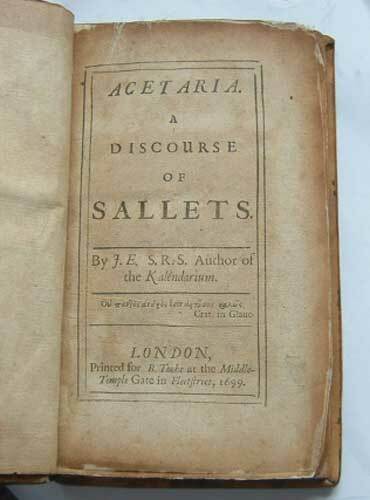 Acetaria is but a chapter in 'Sylva' subtitled 'A Discourse of Sallets'. Part of Evelyn's literary knowledge of the garden were his translations of the French horticultural manual by Nicolas de Bonnefons and the garden poem (in Latin) by Renatus Rapinaus. 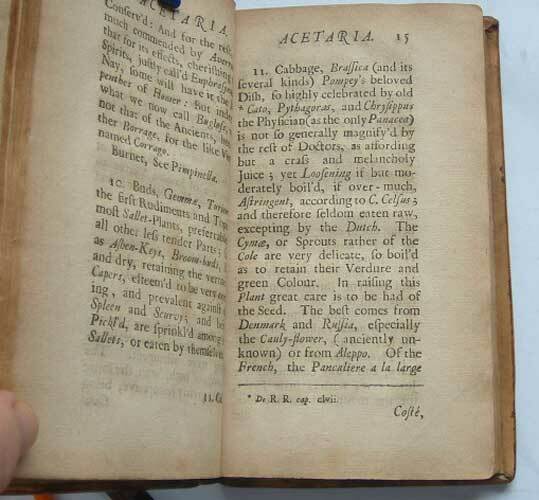 Acetaria is certainly full of observations of how the English ways, either in the garden or at table, differed from French, Italian and Spanish - with occasional reference to India, Germany, Holland, Africa and America for good measure. The text also underscores the relative novelty of some aspects of the art of kitchen-gardening in England: we had much to learn by way of cultural techniques from the Dutch and the French, as well as plants that were of recent introduction, for example the Dutch cabbages brought over by Sir Anthony Ashley. His recipes for dressing salads is knowledgeable and interestingly not changed much in UK and Europe. Quite what Evelyn in his time, would have made of the myriad concoctions assembled to dress salads in America, and particularly in health obsessed California, one wonders. Due to the relative preparation of salads, where cooking is at a minimum, this book is quite ageless compared to other cookery books that mirror changing times. ITS FOUNDERS AND ARCHITECT. BY LOUIS FAGAN, Of the Department of Prints and Drawings, the British Museum. Honorary Member of the Society of Engravers of France; Author of "The Life of Sir Anthony Panizzi, "K.C.B. ;" "The Art of Michelangelo;" "Catalogue Raisonne of the Works of William Woollett;" "Collectors Marks," "Raphael's Sonnett;" etc., etc. WITH ILLUSTRATIONS BY THE AUTHOR. LONDON Bernard Quaritch, 15 PICCADILLY 1887. Large 4vo. 1fep with frontis illustration of the Reform Club library on verso. The Title page in red and black text. The verso with a printers device. List of Illustrtions. (1)vi-viii List of 143 illustrations. 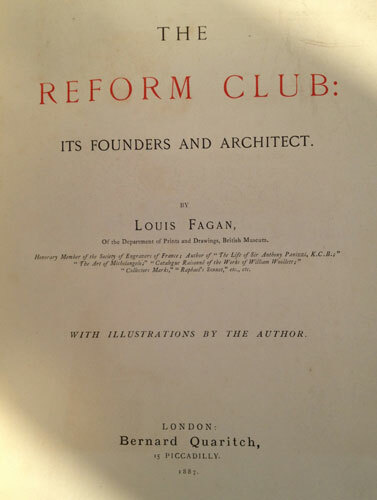 1 page Preface by Louis Fagan. (1)2-143. (1)ii-xiii Index. 1fep. Except for a little water-staining on the borders of the frontis, everything as new. The cover has been very sympathetically rebound recently in the same blue cloth cover as the original and the original gilt lettering on boards and spine. Almost as new. 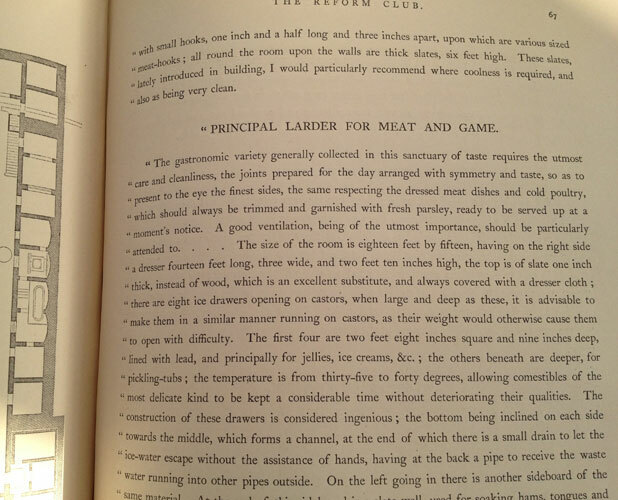 - The 19th century brought an explosion in the popularity of gentlemen's clubs, particularly around the 1880s. At their height, London had over 400 such establishments. This expansion can be explained in part by the large extensions of the franchise in the Reform Acts of 1832, 1867, and 1885. Each time, hundreds of thousands more men were qualified to vote, and it was common for them to feel that they had been elevated to the status of a gentleman, thus they sought a club. The existing clubs, with strict limits on membership numbers and long waiting lists, were generally wary of such newly enfranchised potential members, and so these people began forming their own clubs. Each of the three great Reform Acts corresponded with a further expansion of clubs, as did a further extension of the franchise in 1918. Many of these new, more inclusive clubs proved just as reluctant as their forebears to admit new members when the franchise was further extended. 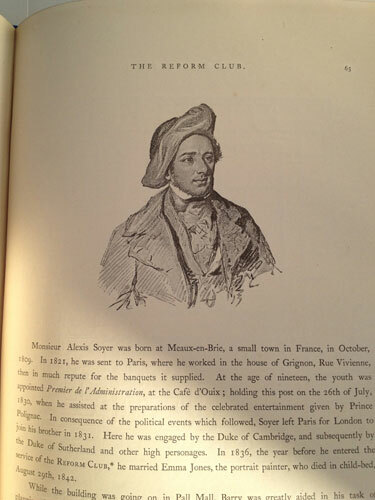 An increasing number of clubs were characterised by their members' interest in politics, literature, sport, art, automobiles, travel, particular countries, or some other pursuit. In other cases, the connection between the members was membership of the same branch of the armed forces, or the same school or university. Thus, the growth of clubs provides an indicator as to what was considered a respectable part of the Establishment at the time. There are perhaps some 25 traditional London gentlemen's clubs of particular note, from The Arts Club to White's, Brooks etc. The Reform Club on the south side of Pall Mall in central London was founded on February 2nd 1836 by Edward Ellice, Member of Parliament for Coventry and Whig Whip, whose riches came from the Hudson's Bay Company, but whose zeal was chiefly devoted to securing the passage of the Reform Act 1832. Significantly, The Reform Club it was the first to change its rules to include the admission of women on equal terms in 1981. It also attracts a significant number of foreign members, such as diplomats accredited to the Court of St. James's. The Reform was known for the quality of its cuisine. Its first chef being Alexis Soyer, the first celebrity chef and cookery book author. He was followed by Charles Elme Francatelli, a former Head Chef of Queen Victoria. 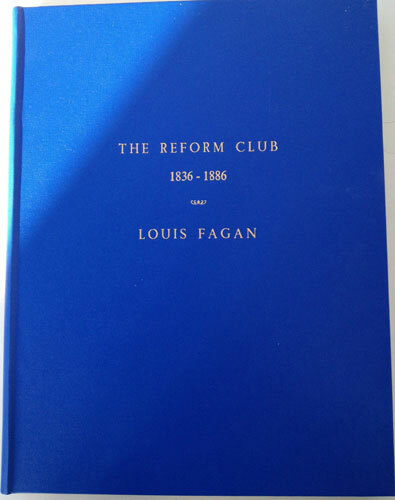 This a very handsome copy printed when the Club was at its height.